I had promised myself a time for drawing in the morning, and in fact, picked up my tray of most recently used chalk pastels from last spring, six months back at least, to draw something. Anything, really. Just something to get going with. I’m have been going through such an artist’s block that it’s no longer funny. I need to do something to get myself in gear. I chose a cream coloured piece of Ingres paper to start with and since I didn’t have any expectations of a fine drawing in the end, I chose some scraps of chalk pastel to work with. I had lots of splinters and crumbles and short pieces of various reds. I pressed these into the paper making incoherent marks, not knowing really where this was going, just looking for some inspiration, just wanting to exercise my experimental side of drawing. Soon I had some flow. I overlaid the bits of red marks with charcoal, still trying to work freely. I hadn’t had breakfast yet and was getting hungry. I hadn’t even had my first cup of coffee, but I knew if I didn’t keep at it, I would abort and abandon the work. Soon I was forming the charcoal layer into a heart shape. It’s one of my themes but I feared for this one because it was not being formed from some inner feeling; it was just starting as an exercise and perhaps would not achieve the substance that the other ones had done. I didn’t like the white background and started to fill the outer edges with more dense reds. Finally I got to a stopping point determined by my realization that if I continued on I would spoil what I had done which wasn’t too bad. I’d have to look at it a while before I could either take another step towards another layer of chalk marks or decide that it was done and spray it with fixative. I left it up on the easel. While I was preparing my first coffee, Mrs. Stepford’s doorbell rang. You might remember that Mr. Stepford, annoyed by my door knocker, decided to give me an electronic door bell for Christmas last year. He even installed it for me. The only glitch in the system is that their frequency is the same as mine, so when their doorbell rings, so does mine. It might not have been important, except that in the time it takes someone to walk from their place to mine, mine rang. I can tell the difference because, when their’s rings, it rings once. Mine rings twice. I was fearing the worst – religious persuaders, newspaper promotions, some cocky sales agent of fixed energy payment equalization (this has been a nation wide scam since utilities deregulation). All I could see was a tall dark man’s shape through the machine lace of the front door curtain. I wished that I had gotten into the habit of at least putting the latch on the screen door. I could see that he was wearing a tee shirt and a none too clean one, too; that ruled out the other people I was loath to see, since they usually came in inexpensive ill fitting black suits and carried clip boards or brief cases. My fears were laid to rest when I opened the door. It was Daniel, our lawn maintenance man, all grubby from his hard labour, his open face smiling broadly. I looked out at my mossy green front yard. There was hardly any grass to cut. If you remember, I discovered a ninety percent ratio of moss to grass as I was pulling out dandelions by hand this summer. The moss was thriving now in this cooler wet weather. It had rained overnight and everything was still damp. Dan started visibly calculating behind his serious blue eyes. “How sweet of you to think of us,” I said and he blushed, a little shy at my effusive thanks. As he turned to go down the stairs to his truck, I mentally groaned that I had given away my drawing day. I might not return to it again today and then, who knows when? For good or for ill, help or hindrance, I always work with Daniel when he comes for a tree trimming project. These are projects I can’t manage by myself – I’m not knowledgeable about chain saws and I’ve been warned I’m klutz enough that I shouldn’t insist on learning. “You wouldn’t want to be missing a few fingers or toes, would you?” Frank had said. Thus it was that my drawing day was hijacked; but when I got outside to point out what I wanted done, I was not one bit sorry. It was likely the last mild day of autumn. The sun was working hard to reverse the effects of rain and some northern cold fronts that had spent time in our corner of the world. The grass was still filled with dew even though it was near noon. Light filtered throught the red and orange leaves of the Japanese maple; the magnolia leaves were bright yellow gamboge. Gamboge, Wikipedia tells me, ” is most often extracted by tapping resin from various species of evergreen trees of the family Guttiferae. The trees must be at least ten years old before they extract the resin by making spiral incisions in the bark and by breaking off leaves and shoots and letting the milky yellow resinous gum drip out. The first recorded use of gamboge as a color name in English was in 1634. ” It’s also one of my favorite yellow pigments in watercolour with its robust yellow tending to orange. The magnolia leaves lay like a skirt below the lightly clad tree as if it were only dressed now in a flimsy petticoat. The colours all about were magnificent. I started to pick up beautiful leaves, not only from the maple and the magnolia, but from the Dogwood and the various nut trees deposited from neighboring homes. I soon had to stop that, or I would have carried a bushel of them into my house to paint – the painting of which I was foregoing for this beautiful day of garden work outside. On the south side of the property, I could see into Mrs. Stepford’s yard. Her sumac was one solid block of vermillion. Against the brilliant grass green, the colours just popped! Daniel, by this time, was sawing off low branches and water-shoots on the apple tree. That didn’t take long. It was quite surprising how much he could clear out of the tree while still standing on the ground; but there was still a lot to be brought down. Agile like a twenty-year-old, he propped his chainsaw between lower branches, grabbed two sturdy limbs and climbed up in amongst them. He grabbed his saw with one hand and continued to climb until he was in the top of this overgrown tree. He proceeded to saw away unwanted growth, then to pull these free of the branch tangles and throw them down to the lawn. I realized it was the first time years that I had seen someone climb a tree. I searched back. My first boyfriend and I used to climb the cherry tree in his back yard to collect fruit for his mom. That was the last that I climbed a tree. Before that, we had climbed the dogwood in the back yard on 36th Avenue before I was ten and had earned a ferocious scolding from mother who was fearful of us falling. When Jason had cut back the Bing cherry in my yard, he had used a ladder. There had been none of this balancing between branches nor the acrobatic extensions to reach out and saw. Daniel stayed aloft while, from the ground, I tried to guide him to cut the right branches at the right length so that in the end, we would have a nicely shaped tree. In the end, he had taken a good six feet of height from the tree and cleared out the crossing branches. The long part of this project is loading up the branches for the yard-waste dump. I began dragging the smaller branches to his pick-up truck and soon had if filled with them. He brought the bigger ones. Undaunted by his full truck, he continued to pile on more and more, occasionally leaping up into the mess of tangled limbs and crushing them down with his feet until he had almost all the branches in the back. Such was the entanglement that they all held together when he drove off. He left me to watch over his tools – the saw, a leaf blower, a rake, two large orange fuel containers looking much like pumpkins in this autumn landscape, and a large green garbage bin with a plastic lid that he used to pick up smaller debris. I couldn’t make progress on the tree while he was gone, I couldn’t leave the yard and his worldly wealth of gardening equipment, so I took the secateurs and headed for my hapless vegetable garden. There I cut the little crown cabbage heads off the top of each stem which, by doing so, supposedly promotes the growth of the Brussel sprouts that are burgeoning out of the stem at the point where each leaf starts. I picked the one lone bean still growing on the vine. I pulled out the blackened tomato plants that had succumbed to the last overnight frost as had the butternut squash that had flowered but never fruited. I heaped up some soil around the fennel which apparently likes this cool weather, although, novice that I am in the vegetable gardening business, I don’t know when enough is enough. In other words, I busied myself with little garden tasks until he returned. We finished packing the truck, raked the leaves and rotten apples that had fallen in the process, cut back main trunks from two of the flowering shrubs and he loaded my six large bags of yard waste into the truck. I added the woody stems of fireweed from the garden beside the front door since they won’t rot easily and while I was there, cut a few glorious hydrangea heads all purples and pale blues for cut flowers in the house. It was four o’clock when I came in from our labours. He had headed down to the yard-waste dump again. He was back in an hour for his pay cheque to which I added a frozen container of apple sauce made from that very same tree that we had trimmed. I was happy to have had some split pea soup with ham already made up. I wasn’t about to cook myself dinner after all that work. I felt invigorated but tired too. All that fresh air. All that lovely autumn colour and sensation. It was worth having the drawing hijacked… There would be another day. I’ve found a variety of excuses for not doing all the things I put off until the summer, pleading the need for hot weather to dry the wood so I could do the exterior painting. The interior painting is another of those things. If I were to paint inside, it needed to be warm enough to leave the doors and windows open so that the paint would dry quickly and the smell would go away. But when summer came, it got too hot, and the smell and the heat would have overwhelmed me, so I put it off to cooler, drier days; but then it rained. Two years ago when I took over care and handling of this lovely house, I found the decor reasonably to my taste and jokingly referred to the previous matron of the house as my personal decorator. There was little I wanted to change. I had to paint the girls’ room because it was to become my office and I couldn’t have blue teddy bears swinging from the moon as my office decor; I had to paint the basement because it hadn’t been painted since Methusala was born and I needed to see where the spiders and their cobwebs were. All the rest of it could be put off until better days. But slowly I became irked by a few things. The upstairs bathroom had been given a few new pre-sale gleaming fixtures – bath towel racks, a toilet paper holder and some new chrome towel hooks. When they had been installed, the walls had been patched but not painted. It was unfinished; unaesthetic. Every time I soaked away the garden dust while lounging in the tub, my eyes would be on level with these unsightly patches and I vowed to repaint these spa-room walls. It took me a year to ponder the colour I wanted. A pale new leaf green, I thought, would be a cheery uplift to this small room. Where else could I make such a colour statement and live with it for twenty years? And if I tired of it, it was a small room to repaint. It would only take an hour or two, n’est pas? When it came right down to it, though, I lost my nerve about the choice of green and I decided on a neutral warm colour. I searched amongst the rows and rows of paints left to me by the former owner and the ones that I had brought from my mother’s house. There was a robin’s egg blue; a Tuscan sun, a desert sable and many other exotically named colours, but only two tins of paint promised the durability of kitchen and bath paint. One with a rusty lid and a spot of pale yellow colour was marked “kitchen” on it. The other was an equally messy tin with “dining” noted on the top, containing a pale peach that just would not do. Neither was enough to paint the small bathroom in any case. It was a perfect excuse to not paint the bathroom. I had no desire to go out to the paint store and buy more paint. Where would I put the leftovers? I was running out of shelf space for more paint. Then, in a brilliant flash of environmental conservation, I wondered what would result if I dumped one into the other and stirred it. Et, voila! I took the two tins, wrestled the lids off and poured the peach into the yellow, complete with a bit of iron oxide dust from the lid. Amazingly, the colour was acceptable and the iron oxide just blended in like a pure pigment that it was. After a vigorous stirring, not a speck of it was to be seen. Bonus! I had an empty paint pail to send down to the paint recycling depot. The choosing of paint and reorganization of half-filled paint pails had exhausted me. I had been at it for at least a half an hour. I found my tools – the paint tray, roller and brushes; a few rags, a pile of newspapers a hammer to close the pail when I was finished and an old ice cream bucket to wash my brushes into afterward. I took the things up to the main floor, set them on the bottom step to upstairs. All that effort deserved a cup of coffee. I sat on the couch and turned on the news. It wasn’t long before the coffee was gone and I was settled comfortably into the cushions, two propping my head gently as I dozed off to sleep for two hours. I had dreams of procrastination and perfectly new-leaf green walls but when I awoke, startled, to an extra loud commercial of some sort, I was only too aware that the paint pot was sitting on the bottom step and not one drop of paint had been married to the wall upstairs. It must have been time for dinner. I had a blind craving for something to eat. I couldn’t start painting on an empty stomach, now could I? I made a cup of coffee and then a chicken sandwich with crab apple pickle, one of my home preserves. As I was rummaging through the fridge returning the pickle, I came across some fresh nectarines and brought one out for dessert. I snitched a few fresh blueberries from the blueberry bowl while I was at it. They would taste a lot better with a tiny bit of ice cream, I thought; and I chopped up the nectarine and an apricot I found sitting out on the counter. I added the bit of ice cream and settled myself down in front of the television to watch the news. I hadn’t heard a bit of it all day. Three soldiers in Afghanistan had been killed by a bomb. A refugee had been expelled from Canada, having lost all right of appeal. A recent immigrant had been returning to Canada and had not been allowed to re-enter because her passport photo had not been clear. There was a follow up on a Vancouver murder and an exposé of a door-to-door scam. The last of the aggravating car insurance ads for that half-hour came on loudly and I suddenly remembered the upstairs bathroom and my intentions to paint it this summer. It’s late August. I’m going away on holiday. It was tonight or nothing! By eight o’clock, I’d cut in all the corners and the tops and bottoms of the walls where the roller couldn’t go. I had unscrewed all the shiny new fixtures and set them aside. I had put away all the towels and the regular array of bathroom counter stuff – toothbrushes, toothpaste, hand lotions, soaps, shampoo, mirror, reading material, the clothes hamper and the scale . It was time for a coffee. It just so happened that a favorite program was on. Couldn’t miss that, could I? Besides the paint had to dry before I put on the next coat. The next program was good too. He wasn’t nervous at all.His stolid complaints annoyed me. I tried to dislodge him from the very corner I wanted to paint. I got rather close to him with the roller but he wasn’t backing down. He was asserting his rights. It was getting late. This little alien creature had more mouth than it did sense. Where else would he stay? Obviously the Martian travel agency was running as scam. That didn’t mean I had to fall for it. I found a glass that was nearby and captured him underneath it. He had no earthly street smarts; he never even suspected I might take him prisoner. He didn’t budge. I put him on the bathtub shelf enclosed in the glass, and he calmly went to sleep, or so it seemed. Perhaps he felt better in a glass bubble. Maybe that’s the way they operate in Martian space. I pondered the ability of Martians to divine my intentions to paint in leaf green as I continued to paint, rolling up the four walls with the creamy blend of scrubbable paint. I vowed to photograph him when I was done with painting. At midnight, I surveyed my progress. It was looking good, but all the cut in edges had to be done again – the first coat hadn’t covered, but it couldn’t be done until the paint dried. Reluctantly, I admitted that I would have to finish it in the morning. I wrapped my brushes in a plastic bag and put the roller in a tube just like a tennis ball tube so that I wouldn’t have to clean up twice. I put myself to bed and slept soundly. In the morning, I arose and cut in the corners again before I even had coffee. I put the towel racks back up and the holder for the toilet tissue. I protected the brushes so that I could wash them up later – much later. I put all the sundries back in place and the towels back on the racks. I got out my camera and photographed this alien creature. I had never seen one of these before and I still have no idea what he is. 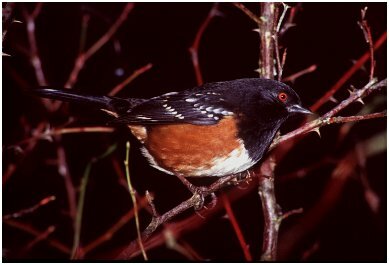 When finally I released him to fly away outside, he clung like fury to my wild shaking of the glass mug. I ended up having to poke a stick into the glass mug to encourage him out. But he didn’t want to go. I can imagine that, as a tourist not speaking the language well, he would be fearful of finding a safe hotel on his own without that exterrestial travel agency. But out he went. I wasn’t keeping him – he complained far too much and he was so insistent on green. Well, he must be staying in my garden somewhere. There’s lots of green for him there. Mrs. Stepford is a kindly soul, and a bit of an animal psychologist. Mid morning, Mrs. Stepford phones. Dorothy is moving. Her house sale went through surprisingly quickly and her move date is on the August 15th. She hasn’t time to come out to get her berries, and since she has to move her freezer, she needs to ship it empty. Between Mrs. Stepford and myself, I promised to buy the berries; Mrs. Stepford offered to keep them frozen for a month. At noon, Mrs. S and I leave for the groomers. We drop the dog off and then head into the farmlands to the red barn. Yes, that self-same farm where I met Mr. Handsome, the strawberry man. Now should I call him the Blueberry man? He’s one and the same person. You choose. When we get there, the only shady spot is in the wake of the old silo now encrusted in various olive green, black and ochre lichens and strapped every twelve inches with a a thick metal wire banding. Mrs. Stepford is out of the car and at the weighing machine much faster than I. When I get there, she is already engaged with Mr. Handsome about the purchase of her berries. I say hello and mention something about bringing my friends with me. He says hello but he’s not so friendly as last time. Barely seems to recognize me, but he’s friendly still and welcoming. But something is not right. He’s distracted, which accounts for the disconnect, I figure. Mr. Handsome is wriggling the connection of the weighing machine to an extension cord that snakes far away across the floor to an outlet somewhere out of view. When that wriggling exercise does not provide results, he tries the connection between the power cord and the electronic scaler, itself. To no avail. It’s not working. All these efforts have given me the time to look as he bends, stretches, crouches,wriggles the cord in his lean, lanky, athletic fashion. There is an advantage to getting old. Your eyes can appreciate without risk of engagement. But this delightful man is also so socially friendly that he keeps bobbing back, apologizing to Mrs. Stepford about the inoperative weigh scale, then about the delay in finding an alternate solution. He strides off to the conveyor belt. It’s organized in an an oval shape with six young migrant workers sitting along the far edge picking off unripe berries, squished berries, twigs, small round leaves Their fingers pluck at the moving belt as if they were encouraging a melody from a well-tuned harp. Their fingers deftly pick out these things to a small band of polished stainless steel at the edge that catches this detritus. The berries amongst it will be saved for the jam factory or other by-products. The leaves and stems will be blown away. Only the firmest, plumpest berries go up for sale to stores and drop-by customers. There’s something different about Blueberry man today. Since last I saw him, he has grown a small beard looking much like a punctuation mark, a bold-text dash, just under his lip. It’s jet black. I point this out in a whisper to Mrs. Stepford. Blueberry man was holding onto a ten pound box at the end of the conveyor belt and allowing the berries to drop into it instead of into the large blue plastic container beneath the belt. The box is filling with berries. He pauses to weigh the box. It’s not enough. He returns the box to catch more berries and continues to hold the it there for the additional amount that will bring it up to ten pounds. As he does this, Newton comes up to me and says, “How did your exhibition do? ” I’m stunned. Baffled. How can Blueberry man be standing at the end of the conveyor box gathering the offerings of the blueberry gods and be here talking to me at the same time. The man before me has a piece of masking tape on his impeccably white golf shirt with his name on it. He has no soul patch. The other man is standing at the conveyor belt, weighing up his adjusted box. He scoops up a double handful of plump indigo coloured berries from the box below and dribbles them in until he gets to ten pounds. He turns and comes toward us. “You’re twins!” I exclaim. ‘You’re not Mr. Blueberry!,” I state looking at the man with the box. “You’re Mr. Blueberry!” I say, pointing at Newton with the scrap of masking tape stuck on his shirt. “Identical twins?” asks Mrs. Stepford. She always knows the right questions to ask. They nod. Mr. Soul Patch points at his golf shirt with Twinberry Farms embroidered in blue on his left breast. Two plump berries are embroidered right under the lettering. The significance of the company name fits into place. Mr. Soul Patch bobs off athletically to get Mrs. Stepford’s change. I fill him in on the date of the opening. I invite him to it. He says he would like to. I remind him that I, too, would like to purchase berries, and he facilitates that transaction. We bid goodbye, smiles all around. Mrs. Stepford puts her berries in the trunk and so do I. We get back in the broiling car and drive off to the air conditioned, silky-cool pleasure of the thrift store and then to pick up her dandified Scottie dog. That was yesterday. Today, Mrs. Stepford calls. “How’s Jessica, the Scottie princess?” I ask. “The little monkey!” laughingly says my friend, the amateur dog psychologist. “That hair cut was just the thing. She’s dancing around the place; wriggling with all her lack of hair, begging to have her short hair caressed. “Must be something like touching a teenage buzz cut,” I reply. The saga of my productive garden is becoming legendary for its inability to produce. We had a lovely day at 22 degrees Celsius and a mild breeze making even full sunshine very pleasant. I tackled the front lawn, if you can call it that. I have a young man come to cut my lawn every two weeks, but I canceled this week because the grass had not grown. The only thing that had grown was a fine crop of dandelion-like weeds. They were waving their pretty yellow flowers about a foot off the ground. My basic goal was to get the flower heads off; while I was at it, I dug up as many of their roots as I could. I found a little red-handled tool, distressed with age that my father had used many years back – he died in ’80 so it’s almost 30 years, give or take a few months. It looks much like a shortened sabre with a curved handle and the blade part forked at the bottom like a snake’s tongue. One inserts this in at the centre of the weed and levers the tap root free of the soil. Then, the weed can be wiggled out of the soil easily, most times without breaking the root. If the root breaks, then the remainder left in the soil persistently will simply re build the plant and give up another finely rooted yellow flower waving, mockingly, “ha ha!! !” in a week or so. As I was pulling out the deeply rooted weeds, I was pulling out anything that was just starting. With each of these littler weeds came fistfuls of moss. I didn’t have a lawn. No wonder it hadn’t grown in the past two weeks. Moss and weeds – that’s what my lawn man has been cutting! Typical of my gardening efforts, midway through my allotted time for weed-pulling, this very effective tool split in half just where the metal part and the handle met; so I gave up weeding and turned my attention to other bits and pieces that needed doing in the garden. One of these was harvesting the radishes. Of course, we all know what a radish should look like. You can get them at fifty cents a fine bunch of about ten radishes. The leaves were so high on my radishes I was convinced that I should get something for my diligence in planting and tending these crunchy, refreshing, “easy to grow” “ready to eat in 45 days”vegetables. It was no surprise to me. My green thumb having once again received the inept award this year, the radishes came out with red roots alright, but there wasn’t an edible round globe to be seen. The roots were long, like two inches long or more, hairy and thick like a straw. I couldn’t resist, thinking that perhaps I had purchased an odd variety of seed, and I chewed into one of these once they were washed. Woody. Unchewable. No taste at all. But I was in possession of a vast amount of radish greens. If that’s my crop, I say, then what can I do with it? So I hopped onto the Internet and Googled “radish greens”. Much to my delight, there were a number of references for radish greens. I started and ended with this one. Its pages look so yummy. And since the recipe was out there for everyone to see, I thought I just might try to cook up some Radish Greens Soup. I’ve been at it all night. After washing them, I tossed them in a large pot to steam for ten minutes. They were soft and very green.When I tasted them, they tasted pretty green too. There’s not much flavour – but then again, there are a lot of vegetables without flavour that are made delicious by the spices and herbs or garlic and butter that one seasons them with. So I added in onion and parsley, salt and pepper and some chicken flavouring. That made it taste much better. Then I took my hand held blender and began the blending process. The greens don’t look too appetizing by themselves and the photo on the Vegan Visitor blog looks so scrumptious. I was looking for that kind of smoothness. Only, every time I put the blender in the pot, it would start dancing on it’s own. It did not want to be led systematically into chopping up my soup. Finally, it began to whir in an unfamiliar tune. You know how motors all have their own sounds. I drew it out of the pot. It was as tangled as if it had gone underwater and been attacked by green octopus; or perhaps it resembled Medusa’s head full of tangled snakes. The stems, you see, are woody and stringy but I didn’t know that in advance. So there I was at midnight, still trying to free the blender blade from these incredibly tough threads of Radish. They are so durable they could be used for dental floss. Now there’s an idea. Organic dental floss! I had a long needle from my upholstering project and I’d dig it in under the tangled mass and pull out what I could, then cut it with scissors; extract that, and then begin again. I got it all, alright, but I was weary of it long before it was done. Did I taste the soup, you may well ask? Of course! It’s an interesting taste. The bit of mint lifts it right out of the ordinary, and yes it’s good. I added some yogurt to get it to go creamy and that improved the recipe, if you ask me. I would have tried sour cream if I had any, but I wasn’t about to go grocery shopping at midnight. In the end, after three hours of work, I have three large yogurt containers filled with radish green pulp more or less blended. With the rich harvest this year, there’s not much room left in the freezer, so I guess I’ll be living on Radish Greens soup for the next little while. Anyone want to come over for soup? At fifty cents a bunch, mid summer, radishes come in tens or so. I figure the nice round edible one I pulled from the ground yesterday puts me five cents to the good on my profitability count for the vegetable patch. Don’t get thinking, though, that this luscious zucchini flower is from my garden. The glorious thing comes from Mrs. Stepford’s garden. Miracles happen in her garden overnight. Especially zucchini miracles. She will take all the fresh zuchinis out of her garden and give them away to friends. They are growing so fast that the next day, she will find another whole crop! They grow over night. It’s creepy, in a way. This long vine-like plant just keeps marching across the lawn with its giant green prickly leaves, sending down toe-holds onto the grass, producing one fruit after another. Amazing! I’ll have to go out this afternoon and see if I have any flowers developing. Frank came by to install baseboards on the main floor. He did an excellent job of it. We hadn’t seen each other in months. In my solitary life, I’ve employed my time with writing, gardening and painting. I see friends and am working at promoting my art work. Of all of these, the only thing in which he is remotely interested is the gardening, so I took him on a tour. I’m rather proud of what I have accomplished in the two years I’ve had this place. It was overgrown. Shrubs had to be cut back. The boxwood was so prolific that a car could no longer drive up the driveway. The iris beds were overrun and so thickly matted together that it was impossible to get a spade through them to thin them out as they should be. I’ve still not tackled that problem. This year I have cleared some areas and turned the soil. I am a rank dilettante at this and happy to be so. I’m mostly interested in seeing what I can grow and with the renewed interest in growing one’s own food, I thought I might give it a try. I understood that several things would thrive on rich soil such as one might find where a compost heap had once been. Whistler, on one of his lengthy visits, found the original compost heap and we used the surface dirt in other areas. When I planned my food garden this year, I had to work around the fact that really, there was very little space left for food plantings. In May, the Triple Tree Nursery had a door crasher sale on seedlings. I went to get some tomato plants at sixty-eight cents each. There were cucumbers and squash plants as well and I had the luminous idea to put one or two in the old composting area. Since the trees had been cut back, lots of light came into this little corner of the yard. I had an ulterior motive. All that garden area needs to be dug over and it’s a big spot. It’s riddled with buttercup and I’ve only taken out a fraction of what needs to be removed. I had a hopeless thought that perhaps the squash and cucumber family of plants would grow so prolifically that their large leaves would cut off all the light from the buttercup and my garden woud not look quite so unkempt. Then I lucked out on a purchase of several flats of annuals from a local farm. They were finished with their sale of plants. In amongst those things that I bought were fennel, so much Brussels Sprouts that I had to give more than half of the seedlings away,onions, a few more tomatoes, some celery plants, more cucumber plants and what else I no longer remember. I spent perhaps fifteen dollars on the total of it, and seven dollars could be attributed to potential vegetables. When I said I didn’t know exactly where I was going to plant them, that the garden was already pretty full, the farm lady said, “Your Brussel Sprouts can go in with the flowers. They are tall and their leaves very pretty. When they flower they are magnificent. Within three days, all was planted. They were not in a vegetable patch. They were, as she suggested, in amongst the flowers with which, normally, I have a modicum of success. That was the end of May. When Frank saw the garden it was the end of June. It’s the end of July now and this is a progress report. I chuckled inwardly as he struggled to keep his disdain from his voice. We have a tenuous friendship now and he was keeping his response in mind of this fact. “I hope you didn’t outlay too much money for all this,” was all he would say, with as neutral a look as he could muster. Since, I’ve had several occasions to doubt my ability to grow vegetables. All previous attempts in my earlier years were disasters. Why would this year be an;y different? Notable was the year that the deer got everything just a few days before I intended to harvest. I consoled myself that they had not eaten the root vegetables, except for the tops of them. When I pulled out the remains, there were no roots. I think I had not watered them as I should. Last year, the only food crop I had planted was yellow beans, but they were not successful. I gave the only bean that produced – yes, just one bean – to my sister to eat, and it was so small and tender that it did not even need cooking. I took Lizbet to see Lillian’s wonderful garden on the fifteenth of July. Now, there is a garden! The cabbages are twenty four inches across. The garlic flowers stand six feet high. The raspberry canes are calling out for passers-by to steal a few of the plump berries. There are rows of tall onion plants. The lettuce crop has come and gone. She allows them to go to seed for next year and they are really rather beautiful, standing a good two to three feet tall with large leafy bases, some ruffled with red, some with a pale soft new green. Everything is developing, growing robustly, big and bountiful. Several times, I’ve thought I should see whether or not my twenty dollars of seedling purchase could be justified. I would love to say that I had profited from my labours. I’m inching up in this regard. The strawberries – perhaps a bowlful as the entire crop – doesn’t count. The plants were free, a gift from Lizbet. The handful of raspberries are already harvested. There were so few at a time that I ate them at the start of my gardening session, a kind of encouragement for my labours. They too, don’t count – the canes were a gift from Heather from her garden. Twice I have given a haircut to my chives and eaten them chopped fine in an omelet shared with some visiting relative. Again – no monetary return. On Tuesday, I harvested ten lovely big broad beans, tender, full of goodness and tasty with just salt and butter. I ate them for dinner. I’ll hazard that I’m thirty cents to the good on that one. More are coming. I don’t know what got into me today. The thriving potatoes that I had planted from sprouting old ones in the bottom of my fridge vegetable bin started to annoy me. They take up too much space. The Brussel sprouts are not growing and I suspect it’s because they don’t have enough light. So I pulled one out this morning only to find a potato half the size of a baseball. I was encouraged. I kept digging, dreaming of a new potato dinner. By the time I was finished, I had a pound of potatoes, I’ll hazard a guess. There’s another fifty cents. I replanted a few of the potatoes that had tiny new potatoes coming to see if that might work. You never know. I cooked my harvest up for dinner. They have rather rough skins which I peeled away. When they were cooked al dente, they nevertheless fell into a powdery mush. Ach! I fried them up with butter, trying to make the best of a doubtful deal. They are the mashed potatoes type of potato. The little bit of butter became a big bit of butter. It didn’t matter how much butter was added, they simply absorbed it. I ate them all – and I didn’t even really like them. I will add though, that my rhubarb is finally eight inches high, the celery is not any higher, the Brussels sprouts are on the average six inches high (my friend Lillian of the green thumb, hers are four feet high. Raspberries and strawberries, are of course, finished for the year. I have one big beautiful flower on the Butternut squash and the leaves, just today, have become big and are beginning to travel across the garden in a direction opposite to the buttercup they were supposed to disguise. The onions that are supposed to be big like a baseball are still looking like bunch onions – small, weak and thin. And that’s my progress report. I think I’ll go out and rip all the potatoes out when it gets cool tonight. I didn’t even like them! Kay had been laid up with a bronchial infection. She ignored it until Saturday and then went to the doctor for some medication. She left the doctor’s office, exiting to a brittle light and promptly protected her eyes with a good pair of sunglasses. The weather was magnificent: four days in a row with high heat and clear magnesium blue skies. Early in the evening as the sun’s rays were dancing long shadows on the lawn, Kay took pity on her poor, ignored flower beds and her neophyte vegetable garden. They hadn’t been watered through this daunting heat wave and it was time to give them a soaking. She set up a soaker hose in the front yard along the north fence-line. In the back, she set one up along the western fence where the potatoes, garlic and strawberries were sharing accommodations. The pots grouped around the small herb garden were on the Saharan scale of aridity. Kay filled ten gallon pail with water then doled it into the various large pots filled with geraniums, lobelia, petunias recently planted and all crying out for a drink of water. In this same spot, she had collected a nursery of transplanted shrubs, a few lilies, Japanese Iris, some winter jasmine, two small Japanese maple saplings and several other pots containing lone vegetables that she was trying to germinate to adolescence by keeping them out of the way of wandering slugs, snails and voracious garden pests. She was only beginning at this home food production and didn’t know what would grow well in the local soil. Kay checked the radishes that were now up far enough to have two roundish leaves each, albeit going a bit yellow from lack of water. She had planted them at the foot of the seedling Maple since it had been the only denizen of a 16 inch pot and the soil was deep and richly fertilized. She admired the two lettuces in another of these big pots, a butter lettuce and a red curly-leafed one, that she had purchase ready-grown to a height of three inches. After a month’s nurturing, they were up another inch and both lacked leaves in the center where she had pinched out a few leaves for a sandwich one day. Radishes were showing first leaves in this pot too. With this darned bronchial infection, she had not been very interested in food. Nothing seems to have any taste. Kay had come into the garden as a distraction from her vague dinner preparations. She had decided on a plain Angus hamburger patty because she hadn’t eaten meat in day, but for the rest, nothing else seemed palatable to accompany it. Now she watered the lettuces. They looked stalwart, healthy and crisp. The idea of a few leaves of this with chives and the chive flowers might just be the right, light accompaniment to the meat,balancing her meal with token vegetables. After all, what was the use of a garden, if you didn’t eat the produce it yielded? She picked a half dozen leaves. Kay pulled off six or seven small fluffy chive flowers and stems plus a sprig of fresh thyme. All she had to do was add a dash of dill dressing and she would not have any kitchen work to do. Clutching this bit of salad in her hand, she finished her watering then went back into the kitchen filled with purpose now that her meal was decided. It’s incredible how in simply watering and encouraging plants, one’s hands can get so dirty. She placed her salad fixings on the counter and scrubbed the soil from her hands. There was a mixing bowl in the sink and she filled it with fresh water, dunking the lettuce and chives in it, swishing them around to get any dirt or little bugs off of them. While it soaked, the meat sizzled in the small fry pan. Kay had a new pottery serving bowl and she collected her dinner into it, proceeding to the living room to eat whilst a bit of television entertained her. It was a perfect dinner – was just enough to satisfy and no more. When the program finished some twenty minutes later, Kay picked up the bowl from the floor where it lay. A small piece of lettuce was stuck to the rim of the bowl and she picked at it, to finish it off rather than let it slide down the drain. It was no leaf! It stuck, glued to the edge. It was a baby slug, clinging for dear life to the darkest part of the glazed decoration! BTW, if you can help Kay identify the potter, creator of the beautiful bowl pictured above, please do. It’s made in B.C. ; it’s got this signature with Scott marked on the bottom, but I’d like to know more. Kay lay steeping her sore muscles, soaking in the hot water that surrounded her. She leaned her back against the sloping tub side, a green terry face cloth the only thing between her wet skin and the hard almond colored enamel. “It feels so good,” she said aloud, although no one was around to hear her but herself. The pleasure of the heat caressing her skin pleased her no end. She contemplated a nice relaxing bath snooze and let herself sink into that half-consciousness. As long as the water stayed hot, she would stay in, she promised herself. It was her reward. It was her reward not only for a day of digging out a long neglected flower bed but also for her successful navigation through three weeks of preparation for the Art Fair, two weeks of house guests and a week away at the Music Festival. Six weeks! Six long weeks she had been driven to do things that had to be done. Now she had time to luxuriate. She had time to contemplate. She had time to listen to the silence. Everyone was gone. Kay dismissed the thought of the visitors. She preferred to luxuriate in thoughts of her day digging up the weed encrusted soil, running her fingers through the silty silkiness, tearing the clumps of grass or buttercup apart to release the precious earth from between the roots, and sifting the soil to remove stones and rogue roots that, if left to their own devices would simply procreate a whole new vigorous weed-plant. The buttercup was the worst. Just a tiny quarter inch of fresh root could regenerate a new plant. It was a vital, eager and aggressive reproducer. As Kay reminisced her day in the garden, she entwined her thoughts of it with the papers she had stumbled across only the night before. Kay had been trying to reduce the mass of family records still encumbering the room she used as an office. She had selected a storage box with her father’s professional papers, thinking that she might be quite successful in throwing them out, reducing volume. But it hadn’t been so. True, there were files that were beyond her understanding, rich with scientific detail, complete with explanatory drawings. The drawings were made in an extremely precise manner, in her father’s hand, illustrating his hypotheses for his thesis in Engineering. Although she couldn’t understand them, she couldn’t simply toss something that had been hand drawn by him. Somehow, it kept him close, though he had died almost twenty-five years before. Amongst the files was one that held horticultural notes written in a fine, even script in an ink that had faded. Or perhaps the ink had been diluted to make it go further. The document had been written in tougher times when cash purchases were a luxury, an impossibility. Ink could have been one of these. Kay ran her fingers lightly over the unlined paper. Each of the written lines was straight; the height was consistent. It was a real find, she thought. It was only the second hand written thing that she had from her father’s father. On her mother’s side, there was nothing written by her grandparents at all. Kay marveled at the writing that had no hesitations, no erasures, no scorings through words. She marveled at the elegant word choices and the careful structure of the essay. It was his second language, Kay thought, “and yet there were no grammatical errors, no spelling errors“. She sighed as she felt the fragility of the acidic paper that was browning and drying out. With just a little bit of handling, it wouldn’t last long. Grandfather on her Father’s side had come to Canada when he was only seventeen. He had worked on the railroad just like her Grandfather on her Mother’s side. He and his brother worked, frugally saving every possible penny, until they could afford to homestead. Kay’s father was born on that homestead in the Interlake district of Manitoba, many miles north of Winnipeg. Kay’s grandfather’s family had always had a teacher in every generation and held a high respect for education. And so, after a long day of working to create a farm, to tend to the fields, to tend to the farm animals, to tend to the family of six children, her grandfather studied. By correspondence, he studied English until he had it to perfection and Agriculture and Husbandry to ensure better yield from his crops and the health of his farm animals. By correspondence, for his pleasure, he took an Art course and a sign-maker’s course. No television for that one, Kay reflected wryly. 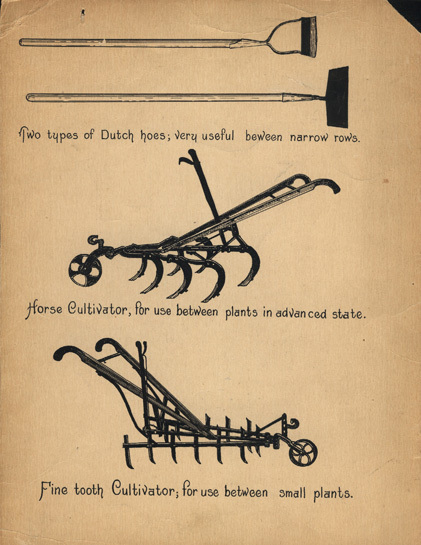 The text was entitled “Fundamentals in host” and it explained the importance of preparing the soil for planting; recognizing the various soil types; improving the soil with manure or chemical fertilizers; cleaning debris and old roots out the soil; and tilling and harrowing the fields to make them even and free of depressions. 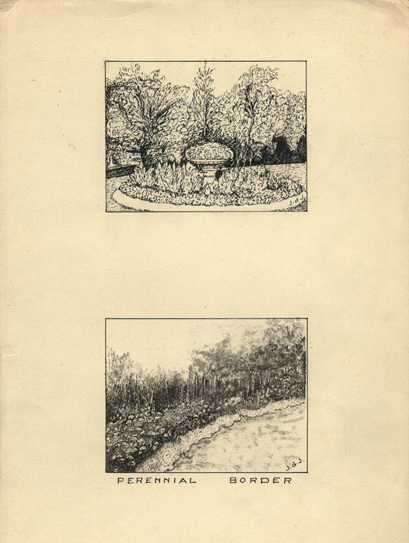 In the same file, there was another shorter essay, “Shrubs and Flowers for the Home Grounds”, describing the planting of perennials to landscape a home garden. Kay spent a few hour transcribing the found texts onto the computer, checking the spelling of the plant names through the Internet, especially the ones she hadn’t heard of before. Delphinium, Columbine, Gladioli, Tulips, Mock Orange, Lilies and Day Lily had been familiar. Trollius or Globe Flower, though, was new to her until she researched and found it was in the family of the Buttercup; and Evonymous, too, was unknown to her. As Kay luxuriated in her warm bath, she relived her efforts in the garden. The massed Iris had formed a solid clump of root. The shovel would not go through it and when she thought of bringing out the machete to cut through it, she rejected the thought. She hadn’t the muscle to make it work. She tugged at one peripheral root and yanked it. It separated from the mass and brought a long trailing root with it. With the persistence of a dog worrying a bone, she separated and pulled the roots one by one until the mass was reduced from an umbrella sized plate to the size of a dinner plate. Finally, with one good thrust of the shovel, she had been able to liberate the recalcitrant mass of roots and wrest it from the soil. ” I wonder what kind of soil this is?” our amateur gardener pondered. It was dry and finely textured. Its brown silkiness slid easily through her fingers like warm beach sand. Beneath the root mass, there were no weed roots nor rocks. The soil had retained no moisture at all. But if one did not know what loam, peat, sand and clay soils were, then what good did it do her? How was she going to improve it? As she raked the remaining soil with her hands, her fingers lodged against a tiny, bright blue object. 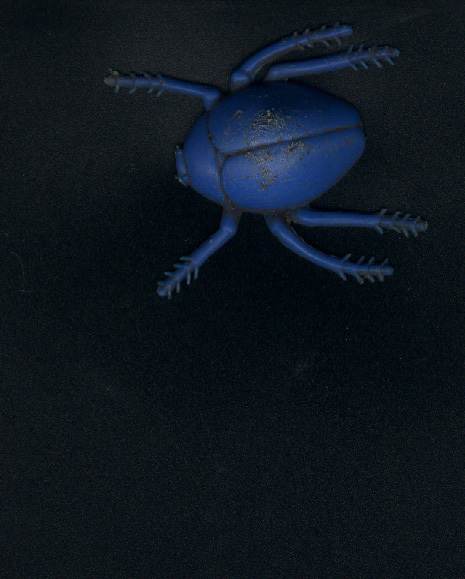 Her archaeological find was a very rare species of scarab, Scarabaeidae plasticus from the late 20th century, a child’s toy. It was not the first artifact that Kay had found. She still had the yellow and black dump truck from the sand box where she had been preparing grass seed for improving her lawn. In the Hosta bed, she had found a cup with a broad red band of forest green on the bottom and a slightly smaller red band on the top and she had found several tiny confetti angels seeded in between the raspberry canes. Juvenile Humus sapiens had lived here before. Kay shifted in her bath, stirred the cooling waters, drained an inch or two and added hot. She settled back into her reclining position and closed her eyes. The sultry waters lulled her. Was it imagination or reality? In her somnolent state, the tiny blue scarab was traversing her clavicle, feet so lightly tripping rapidly as if to sneak across without being felt. She shifted and opened her eyes. It was a spider! A tiny white spider no larger than a pin head was barely grazing her skin. It must have hitched a ride in her hair and now had completely lost its bearings. Kay submerged herself and the spider floated away on the surface of the bath water. It was time to get moving, she thought, and she pulled the plug. The water receded. In seconds, an eddy had formed at the drain hole. She rose and dried herself, pitched her work clothes in the laundry basket and went in search of a whole set of clean ones. “A final thought” she said out loud to no one in particular; after all, the house was empty of anyone but herself, the pin sized spider and the blue scarab. With that, she donned a summer dress, her new tan sandals and went looking for her new white straw hat, looking like the only time she had spent time in the garden was for an afternoon of tea and biscuits.